One of Lillian’s daycare friends turned 3 in January and I found out from her mom that she loves playing with dolls. 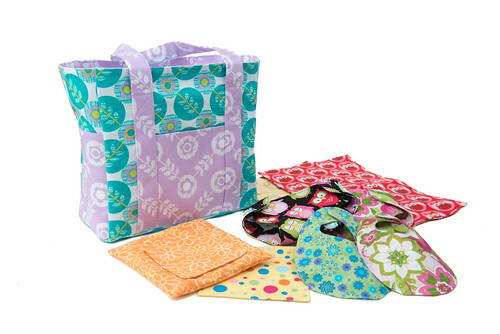 So I thought it would be a perfect birthday gift to make her doll accessories, including a diaper bag! Remember the baptism dress that I made? This little girl is the older sister to the baby. 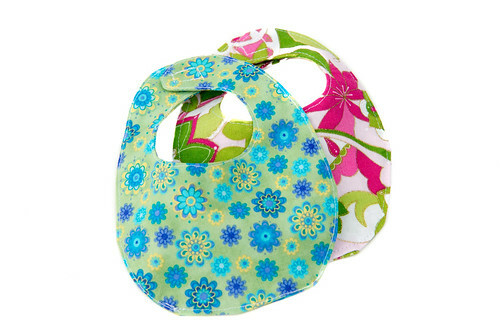 I decided to make her a diaper bag, burp clothes (or they could be blankets), diapers, bibs, wipes, and a case for the wipes. Everything fits inside the diaper bag, plus there is still room for few more things, such as bottles. 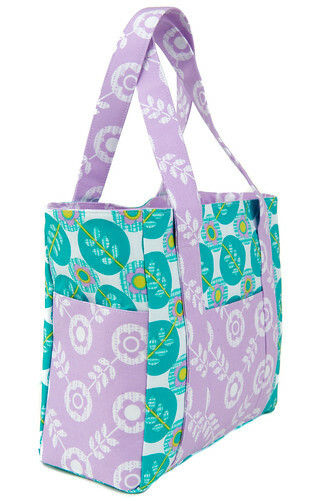 I used my own design for the diaper bag. 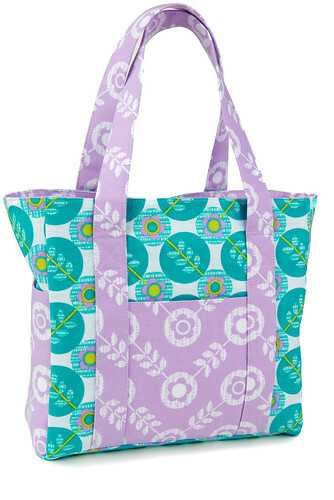 Actually it’s the same pattern as the beach bag that I made, except smaller, of course, and I added a recessed zipper. I wouldn’t want all of the doll’s stuff to fall out after all. There are four pockets on the outside and four on the inside. 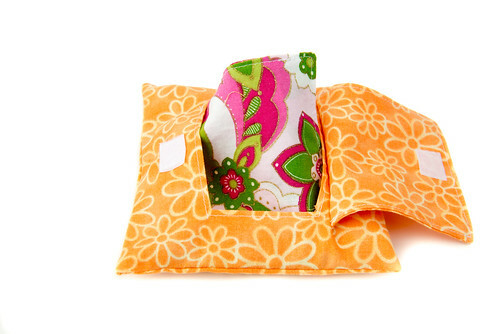 Pockets are always helpful and kids love them! So really, you can’t go wrong with adding pockets. 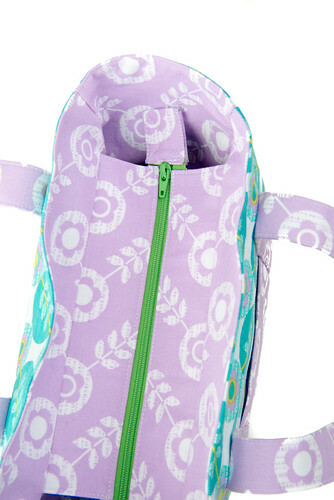 Here is a picture of the recessed zipper. Since the side pieces are sewn to the front and back pieces, I would extend the zipper to the edge of the front and back pieces the next time I make this bag with a zipper. It just wasn’t open quite as much as I would have liked. It’s still perfectly useable and I’m sure no one else noticed, but it’s just my preference. I got the wipes case idea from this tutorial. Christina used fleece, so I had to figure out how to get it to work with cotton which would fray if there were any raw edges. I have to admit that I did leave raw edges on the inside, but used pinking shears on them. I don’t normally like to do that, but it was a wipe case so I figured it wasn’t a big deal. The wipes are just two 5 x 5 squares sewn wrong sides together, then turned, and topstitched to close the opening. Super easy and quick. The bibs were not really that much fun to make. I should have made them a tad larger, but wanted the diapers and wipes to fit the same size doll. They look decent, but definitely aren’t my best work. I don’t think the dolls will notice though. I based them off of this tutorial/pattern, but changed the size and only used one fabric design instead of two. If you have been reading my blog since close to the beginning, then you might remember that I made a doll diaper for Lillian. I used the same tutorial for these as I did when I made Lillian’s. It’s easy to follow and the diapers turn out super cute. 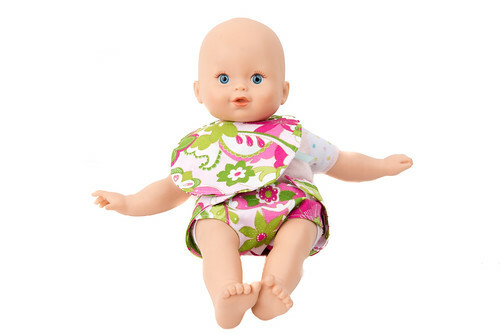 Here is the doll that I used to make sure everything would fit. I am not sure what kind it is, but I do know it was purchased from Target. When I looked there recently though, they didn’t have these anymore. It’s a pretty small doll, maybe 14 inches, but I’m not really sure. 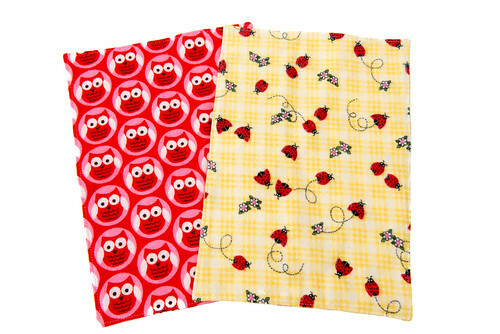 Another easy one is the burp rags, or blankets if you prefer. Again, just cut two pieces of fabric the same size. Sew wrong sides together, leaving an opening for turning. Turn, and top stitch. I used flannel for these, but you could really use any fabric you would like. Here is a behind the scenes picture. Lillian and I are prepping the doll for her picture. 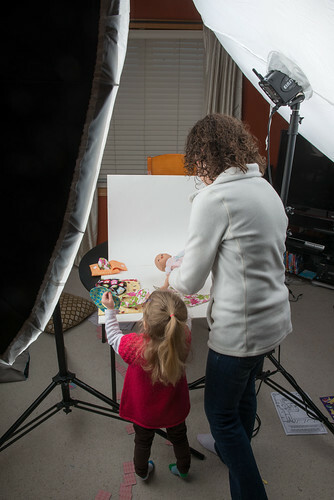 Mark (my husband) takes most of the final product pictures, but Lillian and I help to get things set up. What gifts have you made for young children? Any one else make doll accessories before? Jen made burp cloths for my real babies and they were flannel on one side and chenille on the other. Absolutely the best ever, super absorbent! Love all the doll stuff you made, that is a super nice gift! Oh my gosh, how adorable!!! My girls would have loved that when they were little! Great job, great fabric choices!!! Pingback: Superhero Cape Sewing Novice | Sewing Novice - A beginner's resource for learning to sew.